Custom Electronics specializes in consulting, designing, installing, servicing, and maintaining residential and commercial low voltage systems, servicing the Western Wyoming, and Eastern Idaho region. These systems include Audio, Video, Telephone, Data & Networking, Security, Alarm, Surveillance, Lighting Control, Shades, and Theater. Our smart home technology solutions make your home safe, elegant, fun and easy to use. Businesses experience increased productivity, enhanced environments for employees and customers with user friendly controls. With over thirty years in the industry, our team is comprised of enthusiastic experts in every field. Our number one priority is to provide the best products and services to our clients based on individually tailored lifestyles and needs. 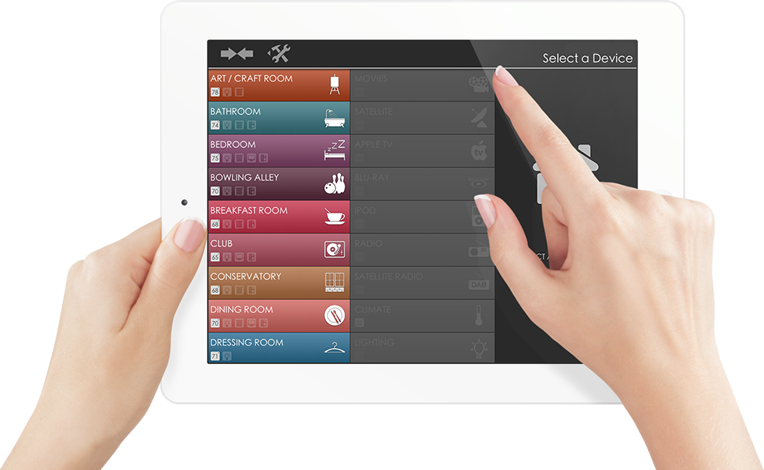 Home Automation eliminates the need to walk from room to room to adjust drapes, lights, temperature, and media. Intigrate all low voltage systems into one easy to manage system and control it from any room or away from home. See our finished work from projects large and small. In every room, with any architecture, we can include premeir functionality and performance. High quality audio and video control with simple commands from a tablet, touch panel or keypad.